Another infill condo project is bound for an appeal at city hall, this time at the behest of Old St. Boniface residents opposed to development along the Red River. 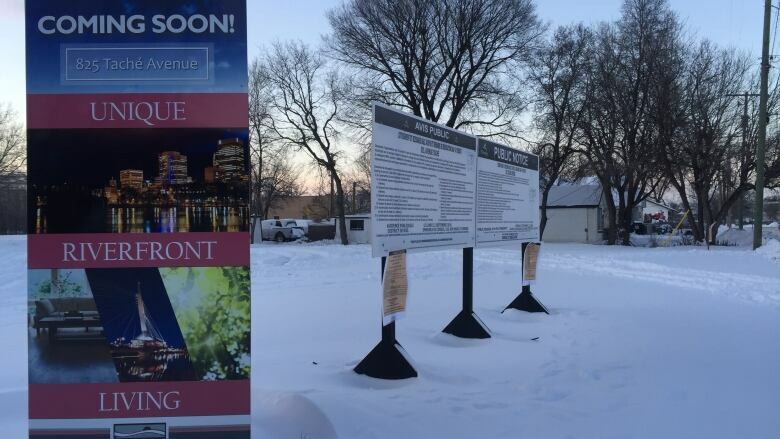 Winnipeg developer Sunstone Resort Communities wants to build a seven-storey condo tower and three two-storey structures on vacant land between Taché Avenue and the Red River. Most of the land in question is a former industrial plot the city sold to Sunstone after council approved the sale in 2015. The plan calls for the condo tower, which would have 78 units, to rise along the river. A pair of two-storey mixed-use buildings and a two-storey duplex would rise along Taché Avenue. In November, city council approved the subdivision of the property and its reclassification from industrial land to residential mixed-use land and parkland. Council's Riel community committee also approved a zoning variance for the project on Oct. 19. Nine St. Boniface residents have appealed the variance sparking a hearing before council's appeal committee on Dec. 15. Seven of these project opponents filed the same form letter, complaining the variance does not meet unspecified city criteria. Project opponent Claudette Toupin, who did not use the form letter, listed off three reasons councilors should disallow the project in a document posted on the city's legislative website. ​She states all of the land should be designated parkland and contends there will not be enough yard space and parking at the proposed condo complex. "The density caused by this variance will make the project more incompatible with the single-family homes recently constructed in the area," Toupin writes. "The reduction of visitor and required parking spaces will cause on-street parking that will lead to congestion during peak usage of the area during the Festival of the Voyageur." The appeal will be heard by councillors Marty Morantz (Charleswood-Tuxedo-Whyte Ridge), Jeff Browaty (North Kildonan), Devi Sharma (Old Kildonan) and area Coun. Matt Allard (St. Boniface), who voted in favour of the variance in October. The appeal hearing takes place one day after council considers a Crescentwood condo project rejected by city centre community committee, but supported by Mayor Brian Bowman and several other members of council.